Before using a Graphical Installer Wizard for the first time you need to configure it. Visit the Configuration of Graphical Installer Wizard section to do it. You need to do this whole procedure only once - when launching this Wizard for the very first time. For next time the settings are remembered in .ini file. 1. Open Inno Script Studio. 2. In main menu, in Tools submenu you can see a new item – Graphical Installer. Click it and you see six sub-items. 3. Click Wizard item (or press Ctrl+Alt+W). 4. 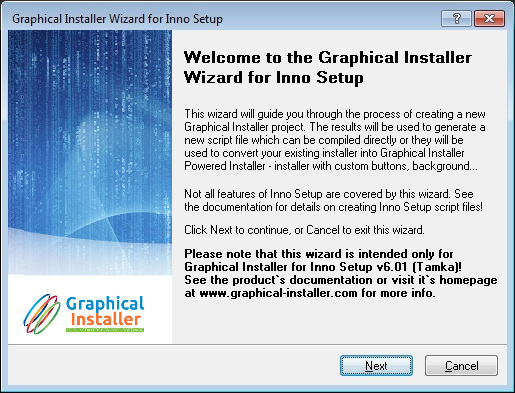 The Graphical Installer Inno Setup Script Wizard window appears. To navigate in Wizard dialogs use and . To quit the Wizard click . Wizard is similar to classic Inno Script Studio Wizard. This manual describes only differences between them. You can find more details about Wizard's pages in Description of Graphical Installer Wizard's pages.